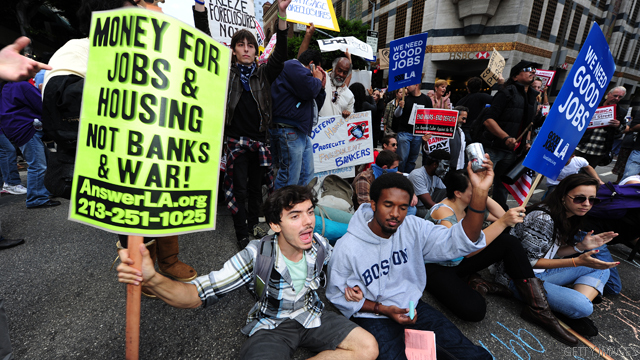 Protestors sit in the street and demonstrate during an anti-Wall Street protest in downtown Los Angeles October 6, 2011. (CNN) - Roughly half of all Americans say they have heard of the Occupy Wall Street movement, and although most of the public doesn't have an opinion about the movement, positive views of it outweigh negative views among those who do, according to a new national survey. An ORC International Caravan Poll released Monday indicates that 51% of Americans say they've heard about the Occupy Wall Street movement, with 49% saying they haven't heard about the demonstrations, which started in New York City 24 days ago and have spread to cities across the country. According to the survey, 27% say they agree with the movement's overall position on the financial system and social change, with 19% saying disagree with Occupy Wall Street on those issues. Fifty-four percent of those questioned have no firm opinion about Occupy Wall Street - consistent with the 49% who say they have not heard of the movement at all. The movement decries corporate greed and social inequality. But demonstrations have evolved to also include topics such as the war in Afghanistan and the environment. On Sunday, politicians fought to cast the ongoing protests in a very different light, with two GOP presidential hopefuls calling them "class warfare" and prominent Democrats expressing support for the protesters. As lawmakers took to the political talk shows, a crowd of about 100 people protested outside the White House, part of a wave of protests spreading nationwide inspired by the Occupy Wall Street movement. The ORC International Caravan Poll was conducted October 6-9, with 1,005 people questioned by telephone. The survey's overall sampling error is plus or minus three percentage points. If the Flea Party represents the extreme left wing of the Democrats, I'll take the Conservatives every time.